Amp prices have lowered over the years and aren’t quite as expensive as they used to be. Not only are these newer models more affordable, but they’ve also gotten a total makeover and are now designed for a wider variety of automobiles, even for those cars that are super short on space. The cost of a class D model is definitely more than what you can expect to pay for a class A or B, but it also gives you more versatility regarding the types of music you can listen to because you’ll note a clearer sound quality with minimal distortion. 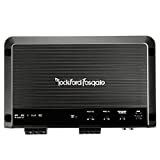 This class D one channel amplifier by Rockford Fosgate packs a lot of power per square inch, taking up significantly less space than other amps that offer the same amount of power. The bass hits loud and smooth and the amp’s versatility puts out six hundred watts RMS to a four OHM sub, but it can crank out about twelve hundred RMS when it is running on a one OHM sub setup. This amp features a variable crossover at twelve DBs and octave slopes. A one channel amp at twelve hundred watts, it’s equipped with the remote bass knob that allows you to instantly turn it up or down. A powerful amp, it comes with a sheet listing for the OHMs. Small and compact it features a cool, sleek design that can be easily stored anywhere in your automobile. This is a big change from the heavy, large and bulky amps of the past, making it possible even for compact car owners to enjoy smooth, clear bass sounds at a louder volume and with a lot of vibration. This model is able to deliver enough power output without excessive power requirements, meaning it responds fast to peak demands that you might throw at your sound system. With the patented punch bass boost and low pass subsonic filters, you can fine-tune subs for maximum performance. This model also allows you to set up an optional wired remote knob, which provides the user with fingertip control over the bass. This model can get very loud, almost as loud as the NVX. A car amp is a device that’s designed to enhance the volume of music, without negatively affecting the quality. This amp is compact and easy to install in a car or truck and drastically changes how you use your speakers and subs. This amp is perfect for a wide genre of music and is able to withstand a significant amount of pressure and won’t overheat from frequent use. Typically, class D amps are more expensive than class A or class B models, but the extra cost is well worth it once you hear how easy and smooth it handles bass. This awesome amp features an impressive frequency of twenty HZ to two hundred and fifty HZ and is considered a great stereo companion. The material used for the casing is made from cast aluminum and comes with a stealthy top control panel that’s mountable for increased durability. This powerful amp also includes an on-board punch EQ, which allows you to fine tune the bass up to forty-five HZ. You can also further customize your listening experience, mixing and tweaking to suit your taste. The infrasonic filter and twelve DB octave low pass and high pass, patented AP crossover gives you even more control over sound settings while adding in cool effects. Pros: One of the best things about this model is that it complies with CEA 2006. It also comes with a MOSFET power supply. Additionally, it’s also protected against overcurrent and short-circuiting, preventing unit breakdowns. This model comes with RCA pass-thru outputs and high-level inputs. It also features power supply thermal sensing and real-time output. The muted turn on and phase switch were popular features with consumers. Surprisingly, this amp weighs in at just a little over five pounds and requires one twelve volt battery to run. The compact design allows this amp to fit into even the tightest setup. Super small and highly portable, it won’t shut down when you push it. This model is small enough to easily fit under a car seat. Easy to install and packing some serious, hard-hitting bass, it also received high consumer praise for sound quality. The solid construction and lightweight build offers more versatility and set up possibilities. Customers who contacted customer service had positive reports, stating that the Rockford Fosgate team were helpful and supportive and worked quickly to resolve any issues. Cons: Some consumers felt that this model may need a cap because it draws quite a bit of power. It also doesn’t come with any mounting screws. Another issue is the brightness of the LEDs on the remote knob and amp, with some users complaining it was too bright. These minor issues were not major enough to deter consumers from purchasing this model. Some consumers also complained about the amount of vibration they experienced when the bass was turned up all the way, however, this wasn’t a common complaint. A solution to this issue is ordering some sound deadening in order to combat the vibrations, which seems to be effective. Best described as a massive power in a tiny package, we loved how this petite amp totally annihilated any sound system around. Your neighbors may not thank you, but you’re sure to love an amp that can trump any sound system on the road. In this price range, many consumers felt that this model easily beat out the competition. With the on-board punch EQ, you have easy and convenient access to adjust the sound quality as needed. The tri-stage production that protects the amp from short circuits, over current and thermal problems is a major selling point for this model and a must-have feature you need in an amp if you enjoy turning that bass way up. Most consumers had nothing but positive things to say about this amp due to the sleek design, fine-tuning abilities and overall sound quality, which is why it received a perfect five out of five-star rating, making it our top rated product. See our recently updated guide to car amps , 4 channel amps and 5 channel amps for the money.